October 22, 2018 information on services, News. We are now in the last quarter of year and it is still not too late to make effective changes to your business. While January is great for new year resolutions and new starts, Autumn has its opportunities also. Technologies that are seeing a huge surge in popularity are associated with electronic document management. This technology has been around for some time and was once only positioned for large global companies. However, even the smallest of Irish businesses are now adapting such systems to increase efficiency in order to become more profitable. Cloud based solutions for business have seen an increase in the use of software that encourages paperless transactions. This allows company data to be stored securely yet enables access 24 hours a day in a secure fashion. In today’s modern office, this is vital for remote workers and mobile devices. How can you back up a box of files? Are you going to photocopy each page and store it at another location, I don’t think so. Having your files and documents scanned and stored securely in the cloud means you have a backup should a bad situation occur. That might be a fire or as a result of some extreme weather, which we seem to be seeing more regularly now. So, what about the happy management and staff I mentioned? Well, here’s the plan…. Get Datascan to collect your paper files. We will scan and index them for you and return them in a format that suits you. Your staff will save hours every week not having to search through cabinets, your sales team on the road will have the information they need at a touch of a button, no more ringing the office. You will have office space back that you can use for something more productive. The time saved in human interaction with paper and files will result in the financial saving that makes any accountant smile. So make this last quarter count. 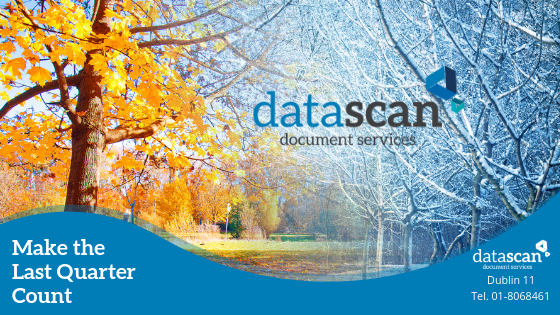 Move your office systems to a more streamlined paperless way, talk to the friendly team at Datascan Document services about a free trial this last quarter.